Here are five common mistakes most people make that could be damaging their vehicles. Avoiding the following mistakes will save you a ton of cash and ensure that your car has a long and healthy life. Engine oil is a vital component in your car, it has 4 main jobs: it cools, cleans, seals and of course lubricates your engine. If your vehicle’s oil is old and broken down it will not be able to perform its job. If you never got your oil changed, eventually the engine would seize up and stop running and/or send connecting rods and associated parts thru the block, rendering the engine useless and most likely unrepairable. Bottom line: It’s worth the time and minimal cost of maintenance! Continuing to drive if your cooling system is boiling could damage your engine. If your vehicle is overheating find a spot where you can park, and let the vehicle cool completely. DO NOT open the radiator cap. The radiator will be extremely hot and under very high pressure. Regularly slamming on the brake or gas pedal takes a large toll on your gas mileage, and can even cause deterioration on parts like your brake pads and rotors. Many people normally fail to use the parking brake when they park their cars on a slight incline. Doing this inserts a lot of pressure on the vehicle’s transmission because only the parking pawl is used. By using the parking brake, you lock up the non-drive wheels as well as the drive wheels and take all the stress off of the transmission. Having too much weight in your car can put unnecessary stress on some of its critical systems, leading to premature wear. Too much weight makes your engine work harder than it should. If there are items that can be removed to decrease the weight and stress on your car, do it now. At Royal Motors we are more than happy to inspect your vehicle and help you understand what you can do to you improve your vehicle’s life. Call us at (407) 201-7950, and schedule your appointment today. 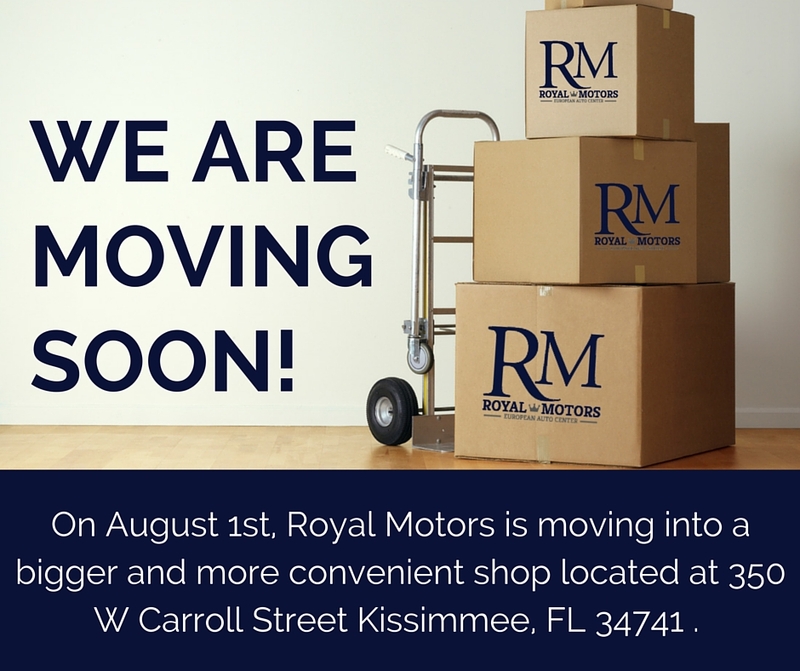 Royal Motors is your dealership alternative! Synthetic Oil VS. Conventional Oil? Most people know that synthetic motor oils typically perform better than conventional motor oils in providing protection for your vehicle, but they might not know why. What’s the real difference between synthetic and conventional oil, are there any benefits? In a nutshell, synthetic oil is thinner, resists temperature extremes better and generally lasts longer. You likely won’t notice any difference in how your car performs, but the durability characteristic is the most important from a car owner’s perspective, as it translates to less frequent oil changes compared to conventional motor oil. Synthetic oil has the highest levels of lubrication and engine protection, generally offering better protection at start-up, better cleansing qualities, enhanced durability and better protection against heat buildup. Here is a little bit of the science behind it: Base oil makes up nearly 80% of a motor oil formulation, and additives make up the remaining nearly 20%. The chemically engineered molecules in synthetic base oil have more uniform properties, while the molecules found in conventional base oil differ in shape and levels of impurity. No wonder why nearly 70% of new cars today use synthetic motor oil to help maintain performance. Check your owner’s manual to determine whether your vehicle requires synthetic or conventional oil. If you want to schedule an oil change, give us a call at 407-201-7950 or come visit us at: 350 W Carroll Street Kissimmee, FL 34741. Also, stop by in the month of October and take advantage of our synthetic oil special, click here for more information. Royal Motors is your dealer alternative! 7 Ways You Can Improve Your MPG This Summer! Remove Weight: Remove excess weight, the heavier the car, the more fuel it will use. Take unnecessary bulky items out of the car. Also remove external carrying kit such as roof boxes or bike racks whenever they aren’t being used. The car has to work harder to cut through the air due to the extra wind resistance such items create. Use Cruise Control: It can be tough in the city, but when you hit the open road, cruise control will keep your car at a constant speed and avoid any unnecessary acceleration that can waste gas. Avoid Rough Roads: Dirt or gravel can rob you of up to 30 % of your gas mileage. Every time the wheels bounce up and down, forward motion energy is removed from the vehicle, the vehicle slows down from the transfer of energy, and this causes the driver to apply more throttle – wasted fuel. Don’t Accelerate Too Quick: Quick acceleration and heavy braking can reduce fuel economy by up to 33% on the highway and 5% around town. Simply put, the harder you put your boot down on the gas pedal, the more fuel your engine will use. Also, the higher your engine is running in RPMs, the more fuel it is consuming per second. Roll Up Your Windows: If you’re cruising on the highway with the windows down, you will cause an aerodynamic drag that can decrease your fuel economy by 10% because your engine will have to work harder. Don’t Let Your Vehicle Idle: During start-up, your engine burns a little extra gasoline. However, letting your engine idle for more than a minute burns more fuel than turning off the engine and restarting it. Properly Inflate Tires: Make sure your tires are inflated to the pressure indicated in your owner’s manual for the best balance between gas mileage and traction. This will translate into significant savings, as being under-inflated by 10 PSI per tire can cost you five MPG or more. FINAL RECOMMENDATIONS: There is plenty you can do to increase your gas mileage, and using these tips will help you save a lot of money. Keep in mind that taking your car in for regular checkups and tuneups can also save you a great deal of money. A car that doesn’t run at its optimum performance level can cost you a lot in the long run. At Royal Motors we are more than happy to inspect your vehicle and help you understand what you can do to you improve your MPGs. Stop by or call us at 407.201.7950 to set up an appointment today!